In 1811 the poet Heinrich Von Kleist, author of “Michael Kohlhaas,” “The Marquise of O,” and “The Prince of Homburg” killed himself on the banks of the Griebnitz Canal in Berlin. In the 200 years since his death, a lot has happened to his legacy. His writing has been co-opted many times by nationalist factions, most famously and ruinously the Nazis. His grave, right where his body was found on the banks of the Wannsee has become a tourist attraction after years playing host to moody young lovers looking to sit in the shade provided by one of Germany’s best known romantic poets. His legacy has been felt in the work of many writers and his books have been adapted numerous times on the stage and screen. The one part of his life that hasn’t been explored fully is the identity of the woman they found next to him that day. Before turning the gun on himself, Kleist shot and killed his friend Henriette Vogel, the wife of a bureaucrat and the mother of a young child. Letters written before the incident suggest that this was something she wanted after learning she was dying of cancer. If you don’t know her name don’t feel ashamed. Her life and legacy have been dwarfed by those of the man who killed her. As so often happens, she’s an accessory to a great artist’s magnificence, one reason why he continues to captivate scholars and students 200 years after his death. But what of the woman who indulged his despair? Doesn’t she deserve the full breadth of consideration given to her famous friend? After all, she was the reason he launched himself into immortality in the first place. 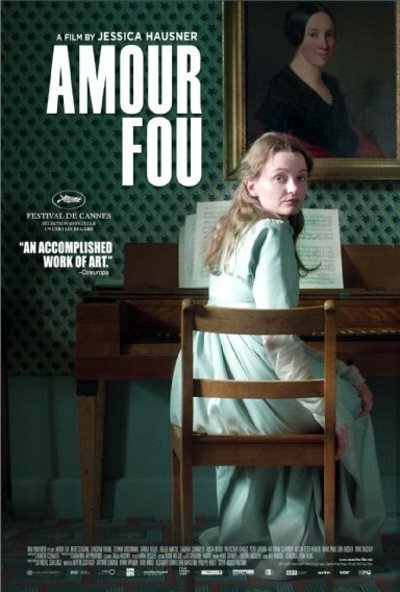 Austrian director Jessica Hausner thought so and with her latest film, “Amour fou,” has gone some of the way towards correcting the historical imbalance of interest in the suicide pact. She’s taken liberties with the facts of the case for dramatic effect, but also because two centuries is a long time to go without someone wondering whether Vogel being shot point blank in the chest was entirely consensual. When we meet Henriette (Birte Schnoeink), she’s uncertain how well marriage and motherhood sit with her. At a party, she's introduced to Heinrich (Christian Friedal), whose writing she knows well, and he takes an instant shine to her. She seems uncertain, especially after learning how high a toll must be paid for Heinrich's attention. He fancies his melancholy incurable and sees but one solution to his feelings of insignificance and hopelessness. The catch is he doesn't want to do it alone. His companion, a rich socialite (played by the ever-marvelous Sandra Hüller), has denied Heinrich's request to die by his side, choosing to marry instead. Heinrich entreats Henriette to kill herself with him, knowing that they have a connection based on a surface dissatisfaction with aristocratic living. It's a little less than an open question as to whether he sees in her a sympathetic, poetic soul or just someone of favorable disposition who could be talked into such an arrangement with a little pointed flattery. Henriette wouldn't normally entertain thoughts of suicide except that she’s recently been diagnosed with a fatal illness. Why not die for a reason, rather than waste away in front of her husband and daughter? Why not, indeed? Vogel’s illness was never questioned as seriously at the time as it is in the film. The official word is that she was going to die either way. The film creates reasonable doubt because its chief interest is in telling the story of a woman at the mercy of circumstances. Heinrich takes advantage of Henriette’s budding sense of self, which has caused her to shrink from her future as much as her disease, and importunes her to direct it towards his needs. One need only take a look at Dominik Graf’s “Beloved Sisters” to know what Hausner's version of Henriette Vogel would have been able to do with herself if she’d fallen in with a different romantic poet, one who might have told her it was possible to channel her ennui productively instead of destructively. Unfortunately there is very little hope that merely staying away from Heinrich was enough to guarantee a happy ending. When Henriette’s husband notices all of the time she's been spending with the drippy poet, he throws his hands up and offers to step out of the way to allow them to be together, rather than understanding what might have drawn his wife to another man. There are a handful of scenes that suggest that a little more interest in his wife’s mental health (as opposed to her immediate gratification or physical well-being) might have saved her from falling under Heinrich’s hazy spell. Both men are guilty, even if only one has death on his mind. Passive masculinity, ordinarily the source of romantic counterpoint (the accommodating husband, the poet mad with yearning) is radically presented as a veil of insidiousness obscuring a woman's agency. Told honestly, the story of Henriette Vogel was never going to raise pulses as spectacle, so it’s a good thing that someone as masterly as Hausner is sitting behind the camera. Since her endearingly abrasive debut feature, “Lovely Rita” in 2001, Jessica Hausner has been chronicling the lives of terminally diffident European women with unrivaled precision, showing the many ways that women can be robbed of control by higher authorities. With every film she's tightened up her diction, turning a frantic scrawl into resplendent calligraphy over the span of just four feature films (including the understated masterpiece “Lourdes”). From the opening image of Henriette standing behind a giant arrangement of flowers - the era’s reduction of femininity to the impractical and ornamental - it’s clear that there was no one better suited to telling a story Henriette herself never got around to putting on paper. Moments later we are in the Vogel’s parlour listening to a woman singing about the ecstasy of death, and Heinrich is reflected in the mirror on the wall just behind her. Hausner found a perfect visual language to tell her story: aureate frames that talk for her characters when they can’t, and talk over them when they lie. She even finds a substitute for the dialogue Henriette attempts to have about her life. After watching the singer in the opening scene, Henriette proceeds to give a few small concerts of her own, singing while her daughter plays piano. In those moments, her smile betraying a welcome anxiousness, a sense of satisfaction and place. Hausner makes the case that she needed a form of expression, and was merely offered the wrong one. Tellingly, Heinrich’s voiceover will bury the sound of her singing, his crises superseding his supposed friend’s joy. All the while Henriette is trapped by Hausner’s compositions. Doors cut rooms in half, restricting her motion. Windows grant her fleeting glimpse of the world she can't enter. Ornate wallpaper becomes a cage to keep her a part of a house’s natural order. There is no way for her to comfortably say what’s on her mind, and when she tries, no one cares to hear it. One of the final images in “Amour fou” rhymes with a shot near the end of “Lovely Rita,” only a few of the details have changed. Hausner has softly evolved in the years between these movies into one of the greatest directors in the world, but her gaze at the enervating fact of female disenfranchisement hasn’t wavered.